On March 15, 2015, Local 47 turns 118. To celebrate, here’s a look back at the humble beginnings of the musicians union of Los Angeles. 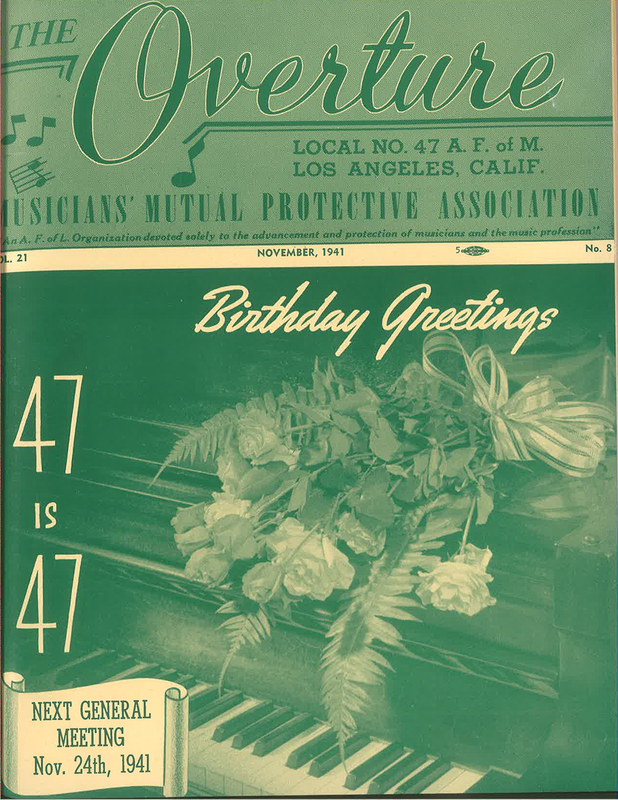 While searching the Local’s archives last month we stumbled upon the November 1941 issue of the Overture which featured an article by former president C. L. Bagley titled “47 is 47: Local No. 47 Has a Birthday.” Therein Bagley described in detail some interesting historical aspects of the very beginnings of our union, much of which is shared in this post. Click on the images in this post to view scans of the original documents. This entry was posted in All News and tagged #TBT, archives, C. L. Bagley, Overture, throwbackthursday on March 26, 2015 by admin.